Editor’s note: News director Spencer Powlison is racing all four of the Epic Rides Series mountain bike races this summer to cover the pro racing and experience the events from a participant’s standpoint. This coverage is sponsored by Fezzari Bicycles, Smith, and Mavic. Powlison will ride Fezzari’s new Signal Peak cross-country bike, wear Smith’s Session helmet and Attack Max sunglasses, and ride Mavic’s new Crossmax Elite Carbon wheelset. I was screaming. It didn’t feel like my own voice but it was. And there was no doubt that my legs, both seized up with knife-like cramps, were the cause. About 10 miles from the Whiskey Off-Road’s finish — at least the place where I hoped to finish — I found myself on the side of the trail, just hoping the pain would pass. 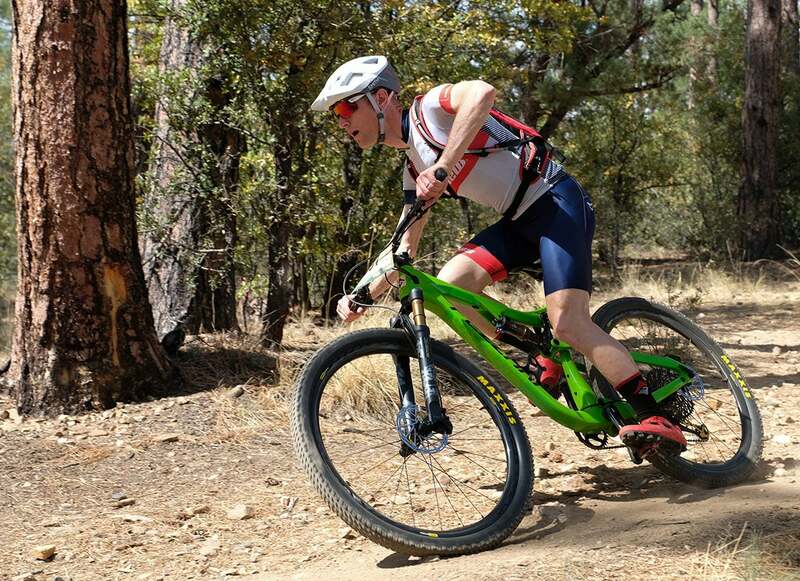 This first round of the Epic Rides Series of mountain bike races in Prescott, Arizona is known for long climbs and a stacked field. Sure, the racing is hard, and I’ll never forget those cramps, but with live music, beer gardens, and a fun downtown venue, the challenge of the 48-mile race is just part of the experience. The first wave of the 50-Proof race started at 7:30 a.m. The Yavapai Courthouse bells woke me up at 5 a.m., a bit before my alarm. The sun was rising with a cool breeze behind it as I warmed up about an hour later, again to those chiming bells. No need for arm-warmers or a vest with a hard climb from the start. Also, I knew it would be best to keep the Sun Red Mirror lenses on my Smith sunglasses. This was my first Whiskey Off-Road, but I had heard the stories about Skull Valley, the course’s brutally hot, exposed 12-mile climb at the halfway mark. With that 2,500-foot monster lurking ahead in the high desert, I was tentative. Everyone started fast — like an XC race. No thanks guys, I’ll just sit in the wheels and save my matches. As the course pitched up on the dirt section of Copper Basin Road and funneled into the doubletrack climb up 9402D, I found my rhythm (and also took quick nature break). We crested the ridge onto trail 260, greeted by the morning panorama. I found myself behind slower riders. With so much climbing and fire road on the Whiskey Off-Road route, some opt for stripped-down XC bikes. The 120mm-travel dual suspension Fezzari Signal Peak I was riding definitely provided an advantage on the loose, steep, rocky descent. Fortunately, those other riders pulled aside to let me open it up on the fast final descent. With only about 22psi of pressure in my tires, I hit the carbon rims on my Mavic Crossmax wheels a couple times. Each time I held my breath, waiting to hear the hiss of a flat, but it never came. Thank God for tubeless. I made up a little ground with my ragged ride down the first major stretch of trail, but it didn’t matter much as we descended into Skull Valley. This would be where the race was won or lost (or in my case, mid-pack finished). The worst thing about this climb is that you see it all on the downhill first. You descend the road you climb, flipping a 180 at 4,500 feet above sea level only to climb back up to 7,000 feet. What I didn’t realize at the time was that my lonely climb up Skull Valley was merely prelude. No, the real pain came after a descent off the course’s high point, where the locals had set up a whiskey and bacon feed zone. In the reverie of a Fireball shot and rocky singletrack, I ignored the warning sign. I shrugged off that twinge in my hamstrings. And as the trail leveled out to take on “Cramp Hill,” my inner thighs seized up. Forget trying to pedal through these cramps. I was off the bike, on the side of the trail, trying to ease the pain. And yeah, I was screaming. Somehow the pain subsided. I carried on with about 10 miles left. But the cramps weren’t done. Twice again I dismounted and begged for mercy. The second time came tantalizingly close to the top of one final hill — a bump in the descent, really. A few more fans had set up a pickle juice stand for desperate riders like me. I downed the briny juice, hoping for any remedy. The pickle juice might have helped. But it was by no means a cure-all. As one intrepid competitor blasted past me on a gradual road uphill in Prescott, just a mile from the end, I tried to hop on his wheel. The fight hadn’t gone out of me entirely. But with one last spiteful twinge of pain, my cramping legs informed me that yes, in fact, I was done racing. I rolled across the finish, about four hours, 10 minutes after setting out. Eventually, the pain faded. Perhaps the race itself wasn’t a success, but the weekend was already on track to be a good one. I traded war stories after with fellow riders. Dave, a Prescott local, had also been felled by cramps. Others fared better in the desert heat. As waves of riders continued to finish, the party vibe became stronger — cut-off t-shirts and jorts became more popular as people whooped and hollered across the finish in the heart of downtown Prescott, Whiskey Row. As the fun half of the race rolled home, the one of the five bands on the main stage was picking up steam. “Banditos,” the second act of the Four Peaks Concert Series was serenading the crowd with a blend of alt-country rock that had a twinge of surf guitar mixed in. I wolfed down a whole pizza and kept mingling. U.S. national marathon mountain bike champ Payson McElveen assured me that the cramps were normal — by his estimate, he got them 75 percent of the time he raced Whiskey! Before she was called up to the stage to speak to the crowd, Willow Rockwell explained how events like this were a cosmic way that mountain biking is healing itself after a phase of intense competition that maybe turned off some casual racers. Heady stuff, but she’s right. The heart of the Whiskey Off-Road is community and fun. Eventually, at the end of the weekend, I ended up at the only spot that made sense after a race that plays out in a classic Old-West town: on Whiskey Row, at the Jersey Lilly Saloon. In a dark, woody bar like this, with gilded mirrors and lights, you can look out on the square, drink Bourbon on the rocks and listen to the Courthouse bells chime.